Facebook currently boasts over 1.94 billion active monthly users, and over 40 million business profiles and those numbers alone should make you realize the immense marketing power Facebook has. Facebook is considered to be one of this era’s most powerful social media marketing platforms, where you have a possibility of always going viral. However, as Facebook’s organic reach has declined dramatically over the years as a result of people’s feed getting more and more saturated thanks to all the content that’s being shared, you have to rely on bigger numbers to get the same effect as you used to. As a result, the larger number of followers you have, the bigger chance you have of going viral and reaching millions in a matter of hours, because ultimately, it is your followers that will help you achieve just that. On Facebook, you can’t just post killer content and wait for the likes to arrive (even if quality content is an important part of building your page). You have to actively work to get those likes, and once you start gaining some traction, you’ll automatically grow your page, however working actively to grow your page should be something that’s on your to-do list even if you’re seeing some success on Facebook. In this article, we’ll provide you with the ways you can grow your Facebook page likes on, and how you can use them. This is the 35 Best Ways to Increase Your Facebook Page Likes, so make sure you use it! 2. Embed social share buttons on your website. Using Facebook social buttons lets your website visitors know that you are to be found on Facebook and can make people click the button and like your page. Since people have already landed on your website, they are more likely to click like (if they like your website of course). When adding a Facebook social button on your website, people are not forced to go through the extra effort of searching for your brand on Facebook to like it, and can instead do it in a single click through your website. 3. Implement social share buttons on your website. A bit similar to the point above, however, the purpose of these buttons are to get people to share your content with their friends. If you’ve written an article, you can add a call to action in the end of it, asking people to share your post if they found it helpful. Because the sharing process only demands two clicks (sometimes just one), people are often willing to share the content with their friends if they believe they will get value from it. 4. Retain your existing followers. If people are constantly “un-liking” your page, you’ll have a harder time growing your page likes. Therefore, not only focusing on getting new followers is important. Instead, make sure you’re also taking care of your existing ones. 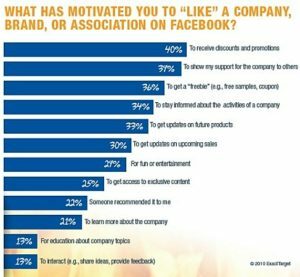 A study by Kentico found that the main reason why people are un-liking a brand on Facebook is that the brand shares uninteresting posts. 5. Add a link in your email signature. The best customers are the already existing ones. These people are also most likely to do something for you, and in this case, it is like your Facebook page. By adding a link to your Facebook page in your email signature, you make already existing customer aware of your Facebook presence and offer them the possibility of liking it with ease. 6. Engage with accounts in your niche. Accounts in your niche have probably already grown some followers, and because they are in the same niche, the people who are liking their page might like yours as well. They just have to find it. By engaging with accounts in your niche, you’re getting yourself out there, and make it easier for people to find you. If you’re lucky, they might even recommend your Facebook page voluntarily because of the value you provide with your comments. 7. Cross-promote. If you have strong presences on other social media platforms, there’s a big chance that a lot of those followers aren’t liking your Facebook page. And as mentioned above, those people who you’ve already caught up in your funnel are more likely to do more things for you. Let people know about your Facebook in a simple blog post or add a call to action as simple as “like us on Facebook”. You can also add your Facebook link in your social media bios or share links to your Facebook posts on Twitter. 8. Take advantage of social media trends. Every day, there are some kind of event or holiday going on, while some are small and not very well known and some are as huge as Christmas, take advantage of them, because they can help increase your page likes dramatically if done correctly. Make a post about the event that’s going on and don’t forget to add a hashtag with the holiday’s name, for example, #Nationalmargaritaday. The reason to that is when someone searches that hashtag/event, they’ll find your post because it will automatically be pushed towards the top thus resulting in more page visits and ultimately likes. 9. Arrange a contest. Contests are great because who doesn’t want free stuff? As you’re looking to increase your page likes, making the rule of entry to like your page is a smart move. If you’d like to get more contestants, ask people to share your giveaway post to get a “bonus entry” or reward those who share it in some way. This will help get more entries to your giveaway and the best of all is that it is your followers who are doing most of the work. 10. Share your content on forums. Forums like Quora, Reddit and WarriorForum are great places to share your Facebook content. Just make sure you’re following the number one rule of content sharing on forums which is providing value. Maybe you have a post which gives the answer someone is looking for – so share it! When your main objective is providing value, people will be upvoting your answer, leading to more people seeing it and ultimately visiting your Facebook page. 11. Mention your Facebook page on your blog. If you have a blog, mention your Facebook page in one of your blog posts and make sure you’re creating a demand for doing so. Let your blog readers know about what’s happening on your Facebook page and ask them to like it so they won’t miss out on future happenings. 12. Reward people who like your Facebook page. If you can, rewarding people, when they like your page, is a great way to skyrocket your Facebook page likes. At least if you’re offering them something they really want. For example, if you would be giving away a car to everyone who likes your page, everyone would do it. Now, giving away a car to everyone who likes your page is unreasonable, but offer people something out of value that doesn’t cost too much are often enough to encourage a lot of people to like your page. It can be anything from an ebook to a month’s free use of your online service. Make sure you’re also taking the other reasons why people decide to un-like a brand on Facebook into consideration when sharing content. 14. Give away coupons. Something as simple as giving away a 10% discount code to anyone who likes your page can make more people like your Facebook page. Let your already existing customers know about the deal via an email because your old customers are most likely to shop from your store again, and a discount code might be that extra push that is needed. 15. Add a popup to your website. While popups often are seen as annoying, they do work. 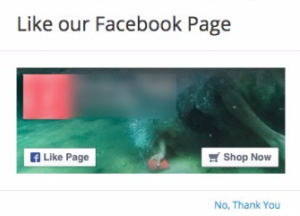 Add a popup on your website asking people to like your page on Facebook. Because a like on Facebook is so easy to perform, a lot of people will do it. 16. Offer special deals regularly. 40% of people reports that they like a Facebook page because they want to recieve discounts and promotions, and 30% reports that they like a Facebook page because they want to get updates on upcoming sales – so give it to them! By letting people know that you share special deals on your Facebook page on a regular basis, you make people want to like your page so that they get access to them. 17. Use Facebook ads. If you have the budget for it, Facebook ads is a really powerful tool. When setting up your campaign, choose page likes as your main objective. With Facebook, you’re guaranteed instant visibility in a way that organic reach only can dream of. This is especially important now as organic reach is constantly declining. 18. Complete your about page. Often times, your about page is the first thing people will see when visiting your profile. Having a completed and appealing about page increases the chances of people growing an interest in your page and ultimately liking it. Include necessary information such as opening times, email, website and an interesting yet short description of your business. 19. Post at the best times. Because your reach is already limited, you want to do everything in your powers to get the optimal reach with your posts and the times at which your posts are made are an important part of that. Studies have found that it’s best to post on Facebook around 9 a.m., and from 1 to 4 p.m but of course, it will also depend on your follower deographics, so make sure you’re experiementing with different times and take notes of which times resulted in the highest engagement. 20. Market your Facebook page to your email list. If you’ve built an email list, taking advantage of it to grow your Facebook page is a must. Send out an email newsletter letting everyone know about your Facebook page or add your Facebook URL in the bottom of each newsletter you send out. 21. Share user generated content. Sharing user-generated content is a great way to get your followers engaged but most importantly, it increases the chances of a social share dramatically by the person which you took the content from. Most often, people are always hyped on getting their content shared by larger brands. 22. Share behind the scenes content. People like to chat with a real person and not a logo. By sharing insights in your brand and the people who work there, you reduce the gap between brand and audience while also helping build more personal connections and trust. People are more likely to engage with a brand when they know who is behind it. And if they like you, they will do everything they can to help you. 23. 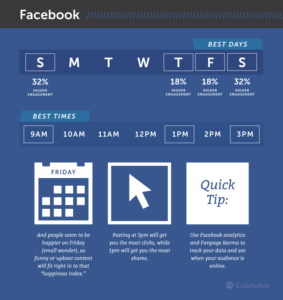 Take advantage of Facebook Insights. Facebook Insights is a powerful analytics tool for your Facebook page that will give you a ton of information on how your page performs. By constantly checking your analytics, you can learn what content your audience likes and what resonates well with them. In this way, you can tweak your content strategy and get a better reach by sharing killer content every time. 24. Limit the characters of your posts. Most people don’t have the patience nor interest in reading page long updates from you. Studies have found that shorter posts with 11-119 characters often result in the highest engagement. 25. 25. Optimize your Facebook page for search engines. Search engine optimization is completely free, it just demands some research and effort. Optimizing your Facebook about section and title with relevant keywords that you want to rank for might help you get more people finding your Facebook page when searching in search engines. 26. Join Facebook groups. Facebook groups that are relevant to your niche is a great place to reach people who might be interested in what you have to offer. Engage with those inside the group and show your expertise in the area in which you’re operating. This can help you become the go-to source for people in your niche when they want to get information about something that you might be able to give an answer to. 27. Use video. 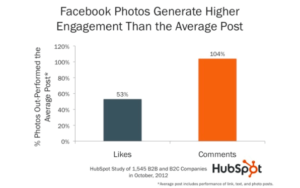 Video is widely appreciated on Facebook because it’s often so much more interesting than a regular post or a photo. 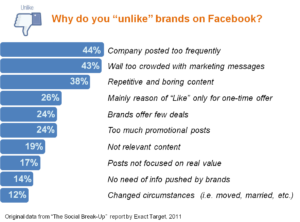 Video also often tend to get higher engagement than other types of content. 28. Tag pages in your posts. By tagging relevant pages in your posts, your post will be visible on their wall, giving you a bigger reach thanks to very little effort. 29. Don’t forget about infographics. Infographics are one of the most, if not the most shared content on Facebook. Post appealing infographics that provide value and people will want to share them with their friends. 30. Team up with similar pages in your niche. Other pages in your niche have followers you don’t, and you have followers they don’t. What you have in common though, is the nature of your followers, because both of you have followers that are interested in the same niche. Promote each other’s pages and agree to ask your existing followers to follow the other page and make your partner do the same. 31. Share content on a regular basis. Sharing content regularly does two things: It lets people know when they should come back for more, and it shows that you are active and serious with Facebook. 32. Get your audience to share content on your page. When they share content on your page, it will appear in the feeds of their friends, giving your page a bigger reach and visibility. 33. Make the overall look of your page professional. When visiting a Facebook page, it only takes a few seconds to see if it’s worthwhile. Make sure everything looks appealing – from profile picture to cover image. 34. Invite all your Facebook friends to like your fan page. Even if you only have a few followers, and just a small fraction of everyone you send an invite to will actually like it, it’s a great way to get exposure and a few likes. 35. Engage with your audience. This is key when growing your page. Show your audience that you care about them and take your time to answer every single comment. Even if it’s a complaint. More correctly – especially if it’s a complaint. This will make it much more likely that they will recommend your page to their peers.